Enjoy warm ocean breezes and the luxury of a spacious vacation retreat conveniently located in the heart of Casa de Campo. Completed in 2009, this villa features a beautiful open floor plan and is professionally decorated with lots of comfortable furniture, Honduran mahogany and marble floors forming the backdrop for colorful Dominican art. 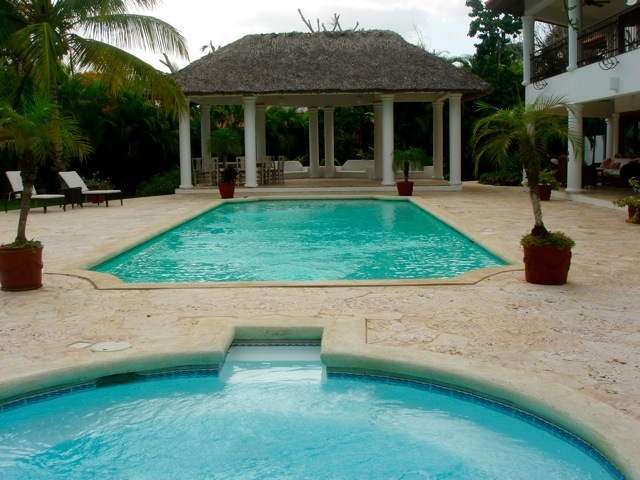 The villa features a swimming pool and jacuzzi, large social areas both sunny and shaded , and a thatched gazebo. Also two romantic showers under the stars. All the amenities to make your vacation the most wonderful and relaxing you have ever experienced. 2 bedrooms are located in a separate building. All have A/C and ensuite bathrooms, some have in - and outside showers. This is the perfect villa for those who want to experience the island atmosphere offered at Casa de Campo - a lush paradise of unsurpassed elegance and breathtaking beauty, where action, relaxation and pampering service combine with an exceptional leisure experience. Villa Nicolas is conveniently located in the center of a residential neighborhood where the exquisite estates on the perimeter are surrounded by the Pete Dye golf course the "Links". The beach at Minitas and the marina's shops and restaurants are in close range.